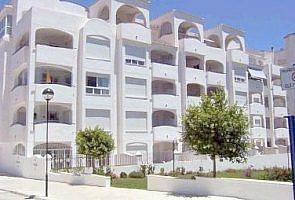 This two bedroom apartment is located on the Don Joaquin complex in Benalmadena in the Costa del Sol region of Spain. It is modern, well decorated and spacious apartment. The complex, which is open from April through October, has a communal pool surrounded by well maintained gardens. The apartment is very central and is only a short walk from all amenities including restaurants, bars and shops. The beach is less than a 10 minute walk and Malaga airport is only a 15 minute drive. The apartment consists of a large living room with comfortable seating and a dining area. There is also a separate fully fitted kitchen. The two large bedrooms both have double beds and the master bedroom has sea and mountain views. There are 2 bathrooms. Air conditioning/heating is also provided and there is secure parking available. A furnished balcony also offers the great views of mountains and the sea.